Yin Chek Hsia: Today's a good day in hell. They must've got Tsing back. Ling Choi Sin: Old Evil is coming to collect the bride. Yin Chek Hsia: Scholar, it seems we've to storm hell! How can anyone criticise this movie? I first saw this film when it was transmitted around 1988 by the BBC when I was working on UK's 2000AD. My pal Steve Parkhouse recorded it on VHS and sent it to me. Up till this point, I'd really only seen the Shaw Bros kung fu movies, with their harsh lighting (so audience could see the moves clearly), so it was a revelation to me to see something that looked like it had been lit by Ridley Scott coming out of Hong Kong. 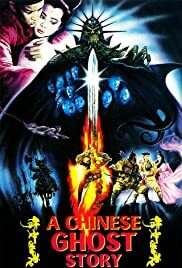 This was also my first exposure to the movies of Tsui Hark (pronounced, apparently, "Choy Huk"). Yet for all the smoky, back-lit exteriors and ambitious special effects (Stop-motion? In a Hong Kong Movie?) at the heart of Chinese GHOST STORY lies a simple and moving love story, made all the more real by the outstanding acting talent of Leslie Cheung (what a tragic, tragic waste of a life!) 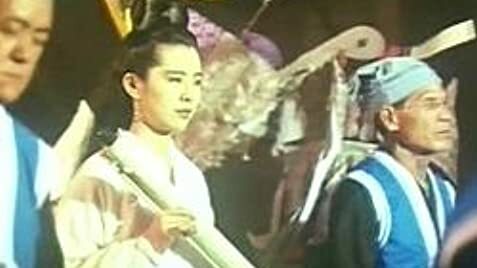 and the beauty and elegance of Joey Wong. Granted Joey is gorgeous, but it's her balletic hand gestures that give her character an unattainable eroticism that's hard to analyse. And though Joey is now almost 20 years older (gawd, which of us isn't?) this will always be the enduring image of that actress. Some reviewers here have said that the film is simplistic and lacks any surprises, but they're missing the fact that this movie was based on a famous Chinese story written by Pu Songling around 1700! That's a bit like complaining that Romeo and Juliet has a predictable ending and just copies WEST SIDE STORY. For me, Chinese GHOST STORY is the quintessential romantic tale. It has high tragedy, because we know that Chio Sin and Sin Seen can never be together. It's about becoming mature, for none of us can mature until we've experienced great loss. It's about sacrifice, for sacrifice is an essential component of True Love. And the comedy stylings of Wu Ma don't hurt a bit, either. Enjoy Chinese GHOST STORY by trying not to view it through a filter of Western culture and you'll get on with it just fine. 40 of 42 people found this review helpful. Was this review helpful to you?